The Camden Town Murder of Emily Dimmock in 1907 - solved! On the morning of September 12, 1907 the body of Emily (known as Phyllis) Dimmock was found in her rented rooms in Camden Town, North London. Her throat had been cut, almost to the point where her head was severed from her body. The murderer has never been found. This is the story of Emily’s life; along with an account of the times in which she lived and the circumstances surrounding her death. A recent survey by Discovery Channel ranked the Camden Town Murder as Britain’s third most famous unsolved murder after the Whitechapel killings of Jack the Ripper and The Peasenhall Mystery . After almost four years of research into all aspects of the case including hitherto unpublished letters and correspondence, contacts with other writers and journalists; and with the benefit of modern forensic knowledge, a solution to this mystery may now have been found. Robert Wood, a designer and artist was tried and acquitted of her murder. It is generally acknowledged that he was saved from the gallows following a brilliant defence conducted by Edward Marshall Hall QC. It is never easy after almost one hundred years to be able to state with absolute certainty that the murderer can be identified beyond any reasonable doubt. My new book presents all the background and the evidence; the reader can make up their own mind as to whether this provides the proof that would have been sufficient for a conviction in 1907. I am forever in the debt of Alan Stanley for introducing me to this case. He emailed me in April 2002 as a result of reading an article I had written on the Old Bedford Music Hall in Camden Town. ‘You seem to know a lot about the history of the area. I am researching my family background and hope you might know something about the Camden Town Murder’. As a result of this chance enquiry I began an investigation that was to take up a large portion of my time over the next four years and lead to the identification of the person I now believe to be the real killer. These pages guide you through the case from Emily Dimmock’s birth, her murder, the list of suspects and the Old Bailey trial. The story begins in 1907 when a young prostitute known as Phyllis Dimmock was found with her throat cut in St Pauls Road, North London on the morning of 12 September. It became known as the Camden Town Murder. Phyllis was not her real name. She was born Emily Elizabeth Dimmock (which is what I will call her) on 20 October 1884 in the Hertfordshire Village of Standon which is on the A120 road to Bishops Stortford. Her father William ran a beer house called the Red Lion. In 1895 the family was living in Hitchin. By late 1897 the family had moved once again, this time to Bedford. In 1901 Emily was working as a domestic servant in St Neots and her father later found work for her as a chambermaid in the Swan Hotel, Bedford. For reasons that were not made clear to her father, Emily was taken away from the family home by her sister Maud, who had married a police constable. Maud later came to live in Putney but according to William Dimmock found Emily a position as a servant in Finchley. That was the last he saw of his daughter. Emily was no more than seventeen when she was put in service in Finchley. In common with so many she drifted to London and the Kings Cross area of North London. Kings Cross and the surrounding area is a network of alleys, dark streets and forbidding premises. The gasometers are a local landmark and prostitutes have always used this area as a place to meet clients. 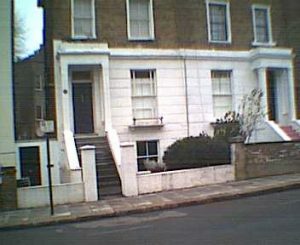 By 1905 at the age of 21, Emily was lodging in a house at 1 Bidborough Street, off Euston Road and close to Kings Cross, St Pancras and Euston stations. The house was owned by a John William Crabtree. He was arrested on and off during the next two years on charges of running a brothel. By 1906 Emily was living with a common law husband, a man named Bertram Shaw. Bert was himself only 19 and for Bert to have married Emily he would have needed his parents consent. 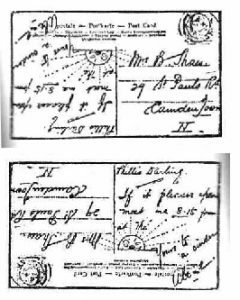 Many marriage certificates at the time state that one of the couple had attained their majority without actually disclosing their age or date of birth. This consent had just been granted by both his parents. Shaw had been employed by the Midland Railway for four years as a chef. He usually left home at about 4.15pm and arrived back in London at about 11.30am the following day. His sister states that he was then working between London and Derby, staying at the latter overnight. On the night of 11/12 September he had a cast iron alibi and was never considered a suspect. When Emily and Bert first lived together they rented rooms in Great (now Royal) College Street. They moved and in 1907 Bert and Emily were living as Mr and Mrs Shaw in St Pauls Road. By day Emily was a dutiful housewife; once Bert had left for work she returned to her previous calling, apparently missing the entertainment provided by the many public houses in Euston Road, particularly the Rising Sun. On Friday 6 September 1907 Emily met Robert Wood in the Eagle in Royal College Street.Wood pulled a postcard out of his pocket which he had brought back from a holiday in Bruges and wrote on it: ‘ Phillis darling. If it pleases you to meet me at 8.15 at the (and here he drew an artists impression of a rising sun). Yours to a cinder.’ He signed it Alice so as not to arouse Bert’s suspicions. This postcard was to be central to the prosecution’s case. It was not posted until the early hours of Sunday morning – Monday 9 September. Bert was still working his night shift on the trains. Emily had taken another man home for three nights, a ships cook by the name of Robert Percival Roberts. On the night of Wednesday, 11 September he was in the Rising Sun with a friend named Frank Clarke expecting to meet Emily again. She was in the Eagle, again with Robert Wood. It was the last time Emily was seen alive. On that Thursday morning of September 12, Bert’s mother came to visit Emily. Bert’s sisters had already been down to London and been welcomed by Emily. They had fond memories of evenings at the Old Bull and Bush in Hampstead. Mrs Shaw arrived early, well before the end of Bert’s shift at 11.30am, so there was no one to meet her at the station. She made her way alone to 29 St Pauls Road. Mrs Shaw knocked and couldn’t raise Emily. Mrs Stocks allowed her to sit in the passage to await Bert. When he arrived home he had to borrow a key from Mrs Stocks. The three of them discovered Emily’s bloodstained body. The rooms had been ransacked, her postcard collection had been wrecked – possibly because they may have contained incriminating evidence. They certainly did not hold the postcard sent by Wood on Monday morning. Two of Bert’s razors were quite visible by the wash bowl. Someone had also cleaned their hands of blood in the wash basin. The police soon pieced together Emily’s life without Bert. The postcard was found by Bert when he moved rooms and was clearing out their belongings. It was published in the News of the World and other newspapers. 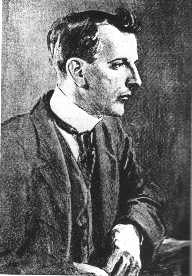 Robert Wood was identified as its author and charged with murder. The evidence against Wood was at best circumstantial. The police investigation was exhaustive and many men were questioned. It must be remembered that these events occurred in 1907, long before the introduction of forensic science, fingerprinting and certainly DNA testing. Emily had been killed by having her throat cut from left to right. By examination of her stomach contents and time of discovery of her body, death was said to have occurred between 3.00am and 6.00am on the morning of 12 September 1907. Emily was still in the position of one who is sleeping. There were no defensive cuts on her arms and the wound that killed her was inflicted with some force. It was assumed that Emily was on the left of the bed, her assailant on the right; when she was asleep her hair was pulled to one side and her throat cut by a right handed person. The medical books I have read all state that to cut someone’s throat when struggling is not an easy option. It is best carried out when the victim is unaware. The last person to have been seen with her was Robert Wood as they left the Eagle pub on the evening of 11 September. Wood was seen there by several of Emily’s friends and also Joseph Lambert, a bookseller from Charing Cross Road. The latter had not seen Wood since the previous February, something on which Lambert had remarked. On the final morning of her life Emily received two letters. One was an advertising flyer from a tailor and the other a large piece of paper folded in four to resemble a letter. Emily threw them both on to the fire but before burning the letter Emily showed it to Roberts, mentioning to him how similar the writing on the letter was to the writing on the postcard. This was Roberts testimony and the only corroboration is the remains of the letter itself. It was not until he was clearing out Emily’s possessions that Bert Shaw found the postcard from Robert Wood. The postcard was seen by amongst others Ruby Young, a past girlfriend of Wood’s. Realising how dangerous this could be he met her the next day and asked her to agree that they had been regular partners and always saw each other on Mondays and Wednesdays. At first Ruby agreed but could not keep it a secret. She told a friend who had a friend who worked in Fleet Street. Ruby was contacted by the police and identified Robert Wood as he walked down Grays Inn Road, close to his home in Frederick Street. Wood was arrested and put before an identification parade. Witnesses were able to identify Wood from the manner of his walk. John Crabtree, Emily’s previous landlord identified Wood as the man who had visited 1, Bidborough Street on several previous occasions. 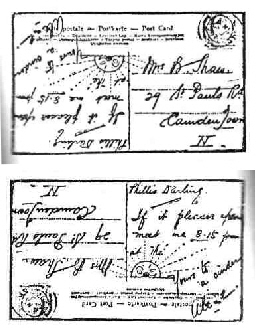 The identification of Wood by witnesses, the postcard in his handwriting and the burned letter and as the last person to have been seen with Emily at the Eagle convinced the police that they had their man and Wood was charged. Robert William Thomas Cavers Wood was one of a large family that had moved south from Edinburgh when his recently widowed father George Wood found employment and a house at 12 Frederick Street, off Grays Inn Road, near Kings Cross. His artistic talent was discovered at the Australian Medical Students Club when he had worked on medical drawings for students. The club closed in 1893 and he found employment with the Sand and Blast Manufacturing Company, a glassware manufacturer in Grays Inn Road. He had no formal training but he continued to draw figures and patterns and by 1902 at the age of 24 he had raised his status and salary to that of designer. With the possible support of his employers who appeared to hold him in high regard, he was represented by a solicitor well versed in criminal causes. Arthur John Newton was involved in the Cleveland Street Scandal and later went on to represent Dr Hawley Harvey Crippen in another famous murder trial. For Wood he secured the services of Edward Marshall Hall QC. Hall was a master of the criminal courts, no less revered than a pop star of modern times. His style of oratory was quite often bizarre but the popular crowd loved him and followed his every word. The public gallery of the Old Bailey was filled with the great luminaries of the day; actors, writers and artists jostled for the reserved seats. The general public filled the streets outside and before them paraded some of the most defiled sections of society to give evidence in the trial of Robert Wood. The case for Wood’s defence was varied. He had gone to extraordinary lengths to ensure that he had an alibi for the evening or September 11. Marshall Hall’s view was that if he was guilty and knew when Emily had died then why try to set up an alibi for a time some eight or nine hours before he needed one. Wood also stated that after leaving the Eagle he had gone back to his father’s home. A neighbour, a keen fisherman who was out in the garden collecting worms, confirmed that he had seen Wood arrive home at about midnight. Wood’s father was ill and could not fully support this story. Many of the public in court were there because of Edward Marshall Hall. They were not disappointed. Marshall Hall’s cross examining was brilliant, his summing up superb but even he believed that Wood’s life still hung in the balance. The judge appeared to be instructing the jury to convict Wood when suddenly he stated that he did not feel the prosecution had proven their case and it was their duty to acquit the defendant. After deliberating for only fifteen minutes the jury returned a verdict of ‘Not Guilty’. The Camden Town Murder remains a landmark in English Legal History in that it was the first time since the passing of the Criminal Justice Bill of 1905 that an accused man in a murder trial was acquitted after giving evidence on his own behalf. The question remains – if not Robert Wood – then who did kill Emily? In her documentary broadcast in the UK on 30 October 2002, Patricia Cornwell admits to having examined a painting by Walter Sickert (as opposed to a mass slaughter of many paintings as has been reported) in order to extract some of his DNA. 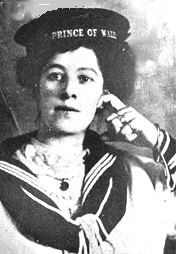 She hoped to prove that not only was he Jack the Ripper but the Camden Town murderer as well. Sickert lived in Camden and he painted a series of pictures called the Camden Town Murders, supposedly based on the Ripper victims. Another subject for many of his paintings was the Old Bedford Music Hall in Camden High Street of which I am sure Emily must have known. Sickert lived close to the shadowy underworld that was Camden Town at that time and that was what fascinated and inspired him. He was living at No.6 Mornington Crescent in 1907, a stones throw from the Old Bedford Music Hall which he painted so often, and could not fail to have known of Emily’s murder. In The Ripper and the Royals (available from Amazon) by Melvyn Fairclough he tells of the royal conspiracy theory surrounding Jack the Ripper. Walter Sickert features prominently but is not implicated in any of the horrific murders. 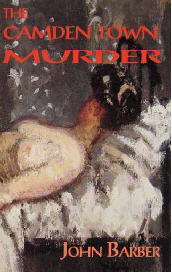 Miss Jean Overton Fuller in her work ‘Sickert and the Ripper Crimes’ recounts the same story as told to her mother by Joseph Sickert, Walter Sickert’s illegitimate son – a conspiracy in which Walter Sickert was a leading figure and who killed the last victim Mary Kelly to stop her revealing to the world that the Prince of Wales had fathered a daughter by a catholic. To the best of my research Sickert had no connection with Emily before or during her association with Bert Shaw. Bert and Emily lived quite a distance from Sickert’s circle of influence and his name is never mentioned in any of the family recollections or by any of her friends. Neither is Walter Sickert’s name mentioned by any of the contemporary biographers of Edward Marshall Hall. I can’t see that there is any evidence connecting Walter Sickert to this murder and it appears that Patricia Cornwell was searching for more murders to link with the serial killings in Whitechapel and has tried to make the suspect fit the crime. There was a nineteen year gap between the Ripper murders and this one. If the murderer was a serial killer then it was an unusually long gap between crimes unless there are other crimes that bear his trademark. None have come to light. The Ripper disappeared after the horrific attack on Mary Kelly; the murder of Emily Dimmock was no less brutal but bore none of the other signatures of the previous Ripper victims. A few people have contacted me about the Camden Town Murder and Jack the Ripper. One in particular has written an excellent essay which although not ending with naming a suspect for the Ripper killings has presented the medical evidence in a detached and erudite fashion. He concludes that there is nothing to link the Camden Town Murder with the Ripper killings and offers strong evidence to suggest that the final murder of Mary Jane Kelly was not that of the serial killer at all. The website is highly recommended: The Whitechapel Murders as is the book ‘by ears and eyes’ by Karyo Magellan, the pen name of a very articulate and talented forensic pathologist. Although Patricia Cornwell has been given much media attention and sold many millions of books she is not the first to put Walter Sickert in the frame. I had quite a long correspondence with Miss Fuller who revealed that Patricia Cornwell mentions things in her book that could only have come from Miss Fuller’s own research but that the latter was never given the proper acknowledgement. During her time in England the BBC offered Ms Cornwell the use of a helicopter to fly to Miss Fuller’s home near Northampton so that the two ladies could compare notes on camera. Miss Cornwell refused the offer. It is Miss Fuller’s conclusion as well as that of Florence Pash (who completed the portrait of Sickert above),and who was at one time the mistress of Walter Sickert, that he had no involvement at all with the Camden Town murder. Once Bert Shaw’s alibi had been verified the list of suspects was eventually narrowed down to just one – Robert Wood. As has been stated earlier the police case was flimsy. Wood admitted to meeting Emily and sending the postcard but apart from that his movements on the night of the murder were inconclusive. The police case rested on Wood sending a letter to Emily arranging a meeting, being the last person to be seen with her whilst alive and of being the person seen leaving St Pauls Road in the early hours of September 12.
Who then, did kill Emily Dimmock? There were some shadowy characters named in the trial such as ‘Scottie’ and ‘Scotch Bob’. These epithets could have been ascribed to Robert Wood, but on the evidence of Crabtree can only be dismissed as acquaintances of Emily without real cause, motive or opportunity to have committed the crime. Although there was testimony that Emily and Robert Wood had been seen in the company of Jumbo Large he was eventually traced by the police as being a trooper with the Life Guards stationed at Tower Hill. He was not considered a suspect. Therefore must the suspect continue to be ‘ person or persons unknown’? It may well have been but for a forensic pathologist making contact with me. His examination of the evidence was the outcome of his own investigation into the canonical five ‘Jack the Ripper’ killings but gave me a new insight into this case and provided evidence to name the real killer. I am not claiming to have solved this case – but I believe there is now enough new evidence to name the prime suspect. The full story is contained in my book with more illustrations and contemporary writings.